It's the time when students put their newly acquired skills into practice; gaining an understanding of industry and the priorities faced in the commercial world. Cameron Ross, a BSc (Hons) Product Design student, secured a role at Hallmark as a Licensing Assistant. On a sandwich course, Cameron took the highly recommended decision to spend his third year in a professional placement. Hallmark is one of the world's largest manufacturers of greetings cards, party goods and stationery. Their UK customers include major high street retailers: all the large supermarkets and independent card shops. They also have several Hallmark branded retail stores. As a Licensing Assistant, Cameron managed and tracked the product approval process for all licensed products, ie branded merchandise featuring a protected image, such as Homer Simpson or Ben10. Hallmark hold or acquire licenses from large media companies like 20th Century Fox to use their images but in return the license holder must approve the product before it reaches the market place. The process involved detailed copyright practice, submitting first designs to the licensor, then communicating any changes requested back to the design manager at Hallmark. This generally included things like changes to the copyright line, changes to the word mark or licensed logo used, or design changes. Once the lengthy and exacting process to approve the designs was completed, Cameron verified colour accuracy with the licensor and one-off samples were created to quality check the finished item. When the finish was approved the product was ready to go into mass production. The placement gave Cameron demonstrable skills and a successful track record in the industry – something employers so often look for look alongside a good degree. During my placement as a licensing assistant at Hallmark I was lucky enough to have the opportunity to design my own licensed product. 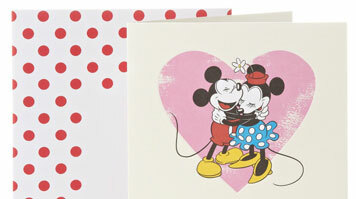 This was a Mickey and Minnie mouse Valentine's Day card, which ended up having the highest sales figures for any Disney themed Valentine's Day card in 2013.